Inspired by Mount Fuji, Japan's most iconic natural wonder, this set features four artisan-crafted brushes with exquisite makie handles. The Fuji Makie Collection is a collector's edition made by hand in small batches, so supplies are limited. They are truly beautiful and unique. First, the deep blue color and intricate gold detail in the artwork is stunning and not done justice in photographs. The set comes with a powder brush, cheek brush, blending/contour brush and eyeshadow brush made from Saikoho (goat). The bristles are supremely soft (8/10) with a healthy glossy/shine. There is density with an airiness to them that I love and am enjoying. 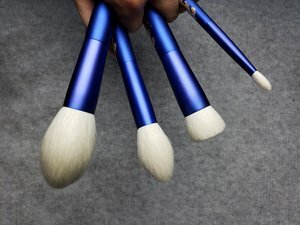 The powder and cheek brush have notable spring and resistance although they are quite flexible, airy and fluffy. In particular the blending/contour brush stands out. It is very densely and well bundled! In comparison to the 2016 Sakura Collection, I think these brushes are better in terms of quality to the amount of hair and bundling of the brushes but they are both equal in beauty and uniqueness. Hands down, a lovely addition for anyone to have!! Brushes are absolutely gorgeous. I feel really lucky that I got these on pre-order. The Mt. Fuji design is truly unique and imo tops the Sakura patterns of the 2015 and 2016 releases. I like the brushed finish of the ferrules; the red in my 2016 Sakura edition has faded with time. Hopefully the matte finish will hold up better with washes. The large powder brush washes and dries to a fairly fluffy consistency but is also dense enough that it strikes a good balance between being directional and providing a diffused look. It's suitable for loose powder and is good for applying powder foundations with a light hand. 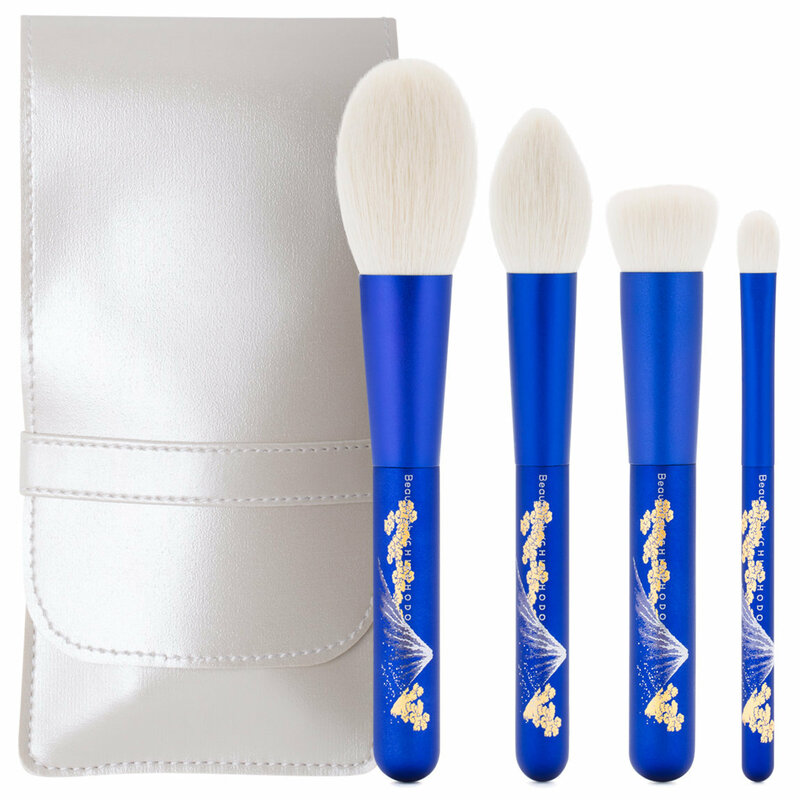 The smaller powder brush is similar to the one in the 2016 collection. It holds on to product pretty well, so if you're lazy like me and don't wash your brushes too often, it can "glop" leftover blush if you're not careful. Part of me thinks the 2015 Sakura powder brush (which was also basically the Z4) edges this one out, but I'm also a sucker for squirrel powder brushes. I do not own the T-3 but it looks like the foundation brush is similar in construction. I typically use brushes for blending out cream/stick foundations and this does it seamlessly. You can go about 2 uses before application gets streaky, and 3 is pushing it. The surface area is large enough to be efficient and small enough to get into areas on my face that can be a challenge (i.e., around my eyes, nose). This one is probably my favorite of the bunch, and gives the GSN-5 a run for its money. I don't own the T-7 either, but the eye brush in this set bears a close resemblance. Chikuhodo tends to make smaller eye brushes so this one is a bit inefficient for my large eyelids but gets the job done. The end is loose enough for it to serve double duty as a blender brush, unlike the 2015 (better for application) or the 2016 (better for blending). Hair is well bundled; I had one hair that was a smidgen longer than the others in my foundation brush but that's not a dealbreaker for me. Now let's get to the one con, and why I knocked off a star: the case. I don't think I'm being nitpicky when I say it's not good at all. Why include this? It is little more than a flimsy pleather envelope. The brushes fit but are a tight squeeze. There is nothing inside the case like an extra flap to protect the hairs. And it's white, which is pretty, but impractical. If you plan on getting your brushes dirty and squishing them in this case, godspeed to you. I would gladly pay more for a better case. Adding something else like a brow or liner brush and including brush guards instead of this case would have been a much better idea. Nothing tops the 2016 Sakura brush roll. Overall, these brushes are beautiful and a welcome addition to my collection, and if you are a collector too, I strongly recommend. I'm already looking forward to the next collaboration! This set is my first by Chikuhodo, and I am very pleased with them. I like face brushes more than eye ones, so this was the perfect set to start! They are very soft and dense, and beautiful to work with. The handles and ferrules are a beautiful blue, and the artwork is lovely. My only wish is that they would not have had the brand written through the scene. Stunning artwork on the handle. This set is very similar to the Chikuhodo Takumi series in size and shape just a tad bit softer. If you already have the Takumi series, you probably don't need both. The only critique is that in the promo photos the ferrule seems to match the cobalt blue of the handle. In real life the ferrule has a hint of purple. I notice it more on the face powder brush. Other than that, these are a win. These are even prettier in person!! Photos do not do them justice! The brushe shapes are great. I am especially enjoying the foundation brush. I like the shape of the eye brush as well. Since I have both of the previous collab sets I can say these brushes hold up exceptionally well and the patterns on the handles look like they did the same day I got them 2-3 yrs ago...so if you are concerned about ruining the handles by using them, don’t be. Beautiful to look at and great To work with. Excellent customer service as usual. Use the powder for a difused bronzer application, cheek for blush and setting powder under eyes, eye brush is great for mature eyes and foundation good for liquids/cream. These brushes are beautiful in their photograph but you really need to see them in your hands to truly appreciate them. Mt Fuji is done perfectly on these brushes, and are very soft. I have never quite seen anything so beautifully made. These brushes aren’t only gorgeous, they are super soft and blend everything to perfection, 3 of them are similar to the 2016 collection but are different enough that if you have 2016 and love them you need 2018 too! My only wish is for a more balanced collection between eye and face. As usual the Beautylish team gives the best customer service of any company I have ever ordered from. The are the most beautiful brushes I think I’ve ever seen. The detail of Mount Fuji on the blue handles is so lovely. The bristles are super soft. 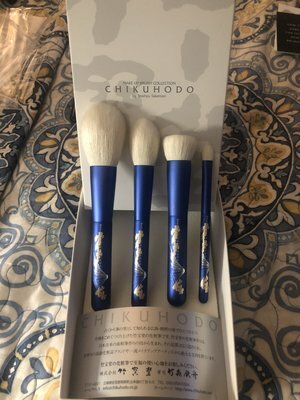 This is my first set of Chikuhodo brushes, and I hope it’s not the last. Softest goat hair brushes ever and just beautiful! Used today with flawless ease and perfect blending.